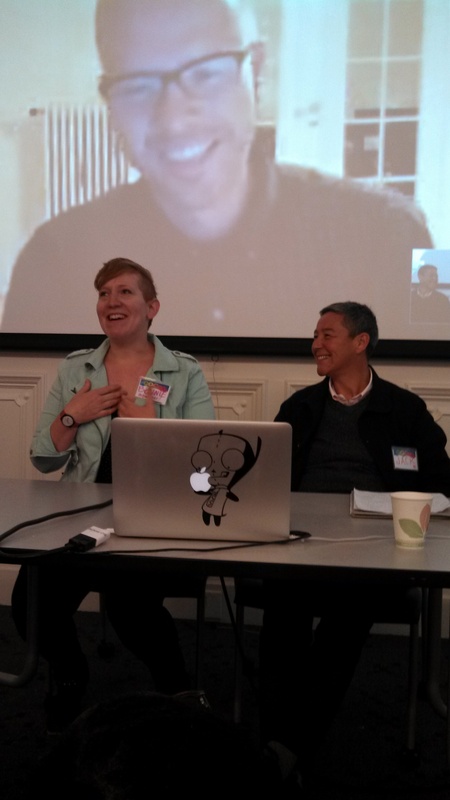 This past weekend, I had the pleasure of attending and presenting at the Queerness and Games Conference at UC Berkeley. Organized by Ph.D. students Bonnie Ruberg and Christopher Goetz and game designers Mattie Brice and Chelsea Howe, the conference brought together fans, designers, and academics for conversations about games (digital and analog) and politics. For a free conference, the lineup was quite impressive: Jack Halberstam, Kathryn Bond Stockton, Anna Anthropy, Jesper Juul, and many other recognizable names and faces for gamers, queers, and academics alike. Bringing together a group of people with such disparate professional goals and backgrounds is no small task, though it is one I hope to see more academic conferences tackle. There were certainly moments of tension. Certain academic disciplinary approaches to particular game characters, for example, were mistaken by attendees for tacit endorsement of their problematic representations. Differences in presentation mode – in terms of depth, specificity, and affect – left more than a few people bored out of their skulls for entirely different reasons. Some people wanted actionable outcomes, others wanted more labyrinthine histories. Everyone was hanging onto Kathryn Bond Stockton’s thrilling whirlwind keynote for dear life. But I don’t want to emphasize the negative here. While sometimes it did feel like folks were talking across rather than to each other, I came out of the experience having gained a lot of knowledge and perspective. For example, I had the good fortune to debut my critical fanvid of Bayonetta (about which I will write more soon) in a “microtalk” session that turned into a vibrant and community-affirming open mic in which people shared resources, stories, ideas, and manifestos in 5-minute speeches that often bordered on poetry. At UCSB, we run an event called the Research Slam. This microtalk session was something that really captured that essence: poster session and poetry slam. We heard from queers sick of gender binaries, closet feminist masochists, designers pitching new concepts, knowledgeable fans offering reading lists for people who want more out of their entertainment. It was all very beautiful and over far too quickly. From L to R: Bonnie Ruberg, Jesper Juul, and Jack Halberstam talk about the arts of failure. Another conference highlight was a conversation between Jesper Juul and Jack Halberstam, whose books, The Art of Failure (2013) and The Queer Art of Failure (2011), respectively, are landmarks in their individual fields yet do not speak to one another directly. Juul and Halberstam engaged each other in a woefully short conversation moderated by conference organizer Bonnie Ruberg in which they discussed the political significance of failure and how we might leverage it in anticapitalist and queer political frames. Halberstam’s position as a queer theorist without training in game studies really helped to highlight the broader implications of Juul’s work on gaming. The conversation uncovered that both books have an interest in masochistic pleasures, for example, though neither text necessarily articulates it as such. Failure is not simply a refusal of participation in hegemony, but rather a way of inhabiting and moving through the system in particular ways; at one point Halberstam observed that continuing to play a game requires the gamer to fail – otherwise, you eventually win and then you’re done. This panel really brought out the importance of accounting for the necessity of failure in the shaping of the subject and of systems of power, not merely in an antagonistic embrace but in order to deepen our vocabulary, as Halberstam explained, to account for the fulness of experience. Postdoctoral researcher Kelli Moore turned the conversation at the very end toward thinking about how constraint and indebtedness might open us up to degrees of freedom (rather than “freedom” itself) and the possibility for forming communities. I couldn’t help but think about this in relation to games: it is constraint that makes gaming possible at all. It was truly astonishing how many threads kept weaving the conference talks together throughout the weekend – failure, childhood, shame, design, queer, game, community. Samantha Allen‘s featured talk on gamer and queer shame opened new questions, for me, about a theoretical concept I had thought recently retired. Stockton’s keynote turned our attention toward queer children and posed hypothetical game design challenges surrounding them, ultimately questioning heteronormative temporalities and our own shames and fears about growing up. Halberstam, after his duet with Juul, went on to talk to us about the queer possibilities of animated films like Wreck It Ralph, which took me back to my own panel at SLSA this year and Ed Chang’s talk about Vanellope Von Schweetz. On Saturday night, we were treated to pizza and Chelsea Howe and Michael Molinari‘s Kinect-enabled soundodgerLIVE! “dance” game. Projected onto the dark sidewalk outside of Berkeley’s historic South Hall, soundodgerLIVE! filled the night air with epic wubwubs while conference attendees tried their hand (or feet, as it were) at guiding a white dot through a circular field of dubstep-generated hostile triangles. It was scrolling shooter meets limbo meets don’t-step-on-the-crack, and very few people did very well though we cheered for them all. Failure. Shame. Game. Queer. Community. Eventually, someone let us in on a secret: the dot wasn’t controlled by foot position, necessarily, but the Kinect’s calculation of your body’s center of gravity. The less you moved around, the more you could move the dot by shifting your hips – effectively “hula”-ing your way to victory. I wanted that to be a really insightful metaphor that pulls together QGCon elegantly for the benefit of the reader. I think, somehow, it does. But I’ll leave it up to you to elaborate it.